You need a Pinterest strategy that isn't at the whim of an algorithm change! The smartest Pinterest strategy is leveraging promoted pins in your business. Pinterest is in the business of making money, just like you and me. This is why advertisers always receive priority on their platform. Pin Practical Promotions is your next-level course on how to strategize, implement, analyze, and refine profitable promoted pin campaigns at a low-cost to you! Pin Practical Promotions taught our Pinterest agency how to run effective promoted pin campaigns that serve a variety of goals for our clients. The step-by-step thorough process helped us understand promoted pins in a deeper way without all the trial and error of running several failed campaigns. We are no longer floundering, we're streamlined in our system with promoted pins. Pin Practical Promotions is a game changer! OUR DOORS OPEN AGAIN IN JUNE! Here's something awesome for you while you wait! Enroll now in your FREE Pin Practical Ads challenge. A 3-day training where you'll be shown how to set up your promoted pin campaigns for success! This is practically impossible to do with Facebook Ads and it's exactly why you need promoted pins in your business. Thanks to Pin Practical Promotions, I have been able to make my promoted pin ad spend back plus bring in extra revenue from tripwire sales and upsell sales! I'm getting new people on my list that I can sell to later which is a win all around. This course is so much more than just how to do a promoted pin campaign. It's your strategy behind it, how to make the most out of it, and optimize it. I never would have figured this all out myself. When you invest in Pin Practical Promotions, you are going to make your money back at some point if you follow the funnels in the course. You don't have anything to lose because Monica will help you every step of the way. In the Facebook group, she always answers every question plus there are live office hours too. You really can't go wrong with your investment in this course. Monica is my favorite resource for all things promoted pins and sales funnels! I collected 456 new email subscribers and paid only $.93 cents per email! This is an amazing cost to acquire new email subscribers in the B2B space! Plus, I made my money back on the ad with tripwire sales and upsells with a 128.84% return on ad spend! UNLOCK THE POWER OF PROMOTED PINS IN YOUR BUSINESS! Promoted pins are unique for many reasons and the one that stands out the most is it's the ad that keeps on giving. There are very few resources available on how to run successful and profitable promoted pins. Pin Practical Promotions is not just about showing you how to tactically set up your campaigns. PLUS... the course comes with an incubator Facebook group only for course students. You'll have my eyes on your campaigns too! I had several key takeaways from Pin Practical Promotions. 1) I don't need to bid the (ridiculous) amounts recommended by Pinterest. I can use a much lower bid and still be successful. 2) The advice on which type of audience to use for different campaign types is very practical and helpful. 3) The module on using analytics for better ad performance is enormously helpful. I love numbers, so I found it really helpful to have benchmarks to use for analyzing campaigns and action steps to take based on ad performance. Everything you do on Pinterest derives from having a good funnel in place. Pinterest ads are so cost effective, it is possible to recoup your ad investment and MAKE MONEY from running ads. In Pin Practical Promotions, you'll get FOUR FUNNELS you can replicate to put your email signups and new purchases on autopilot using promoted pins. Exactly how to set up effective sales funnels for Pinterest! STEAL MY MOST POPULAR FUNNELS INSIDE THE COURSE! I've tried everything to increase my opt-in rate for my email list. I mean everything and this was the first time that something worked consistently. My blog is small and my side hustle, so I don't have time to work endlessly on it. Promoting a pin DOUBLED my email list. And the best part is that I reached the right people and my emails have a high open and click rate. I've taken countless courses and read everything I can find about creating opt-ins, using Pinterest, and so on. Pin Practical Promotions was by far the best investment I've ever made. I truly wish I'd taken the course earlier and saved myself enormous amounts of time and money. I collected 370 emails. Each email cost only $0.65! I'm still working on optimizing these numbers using the methods in Pin Practical Promotions. I feel like the campaign was successful because it's the only thing that's worked for me so far. And it was only my first campaign. 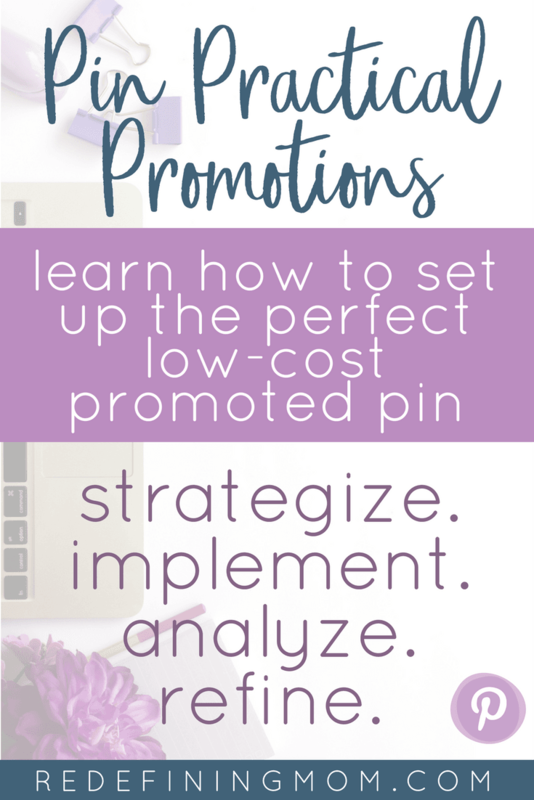 Pin Practical Promotions is updated for 2019 to reflect ALL of the most recent changes to promoted pins! Here are highlights for what you'll be shown in each module. PLEASE NOTE: I no longer publish the exact titles of each lesson inside of the modules. Above are the highlights for what you will be shown. Every module provides very detailed content on each topic. Please feel free to use the chat function on this page to ask any specific questions you have regarding the content of the course. I'm happy to help! 9 BONUSES VALUED OVER $1,000! A 16-Page beautiful Pin Practical Promotions Workbook so you're able implement all the steps of the course! A 40+ Page amazing Pin Practical Promotions Primer eBook to get you started! Ruth made her Pinterest ad spend back in ad revenue from her website! "The Pin Practical Promotions course has taught me that promoted pins are not just for the blogger or company with huge pockets. Even a blogger, like myself, with a very tiny budget can make a huge impact on their business by running inexpensive Pinterest promoted pins. I don't know of any other program that breaks it down so simply and shows you how economic using promoted pins can be. 150 email addresses at only $.63 per email! Kristen doubled her email list! "The nice thing about when I got those increased subscribers, my sequence that I had them go through led them to my gardening course. I actually sold enough gardening courses to pay for the Pinterest ads. I've only been a garden blogger for about a year. These attempts with Monica's course are basically my first attempts at trying ads and trying to make money off of my blogs. If I can do it, you can do it. READY TO MAKE MONEY WITH PROMOTED PINS? Hi! I'm Monica a professional blogger and Pinterest marketing expert. I have an MBA degree in finance and marketing and blog at Redefining Mom, a site for helping moms thrive in both motherhood and business. In 2015, I traveled to the White House to discuss family-friendly workplace policies with the President Obama's senior advisors and have been featured on several media outlets including Fox News, Healthline, and Mom Talk Radio. I provide online marketing education to professional moms who are looking to build profitable blogs through effective sales funnels and Pinterest ads. Who will benefit from taking Pin Practical Promotions? Pin Practical Promotions is an advanced-level Pinterest course focused solely on setting up, implementing, and benefiting from low-cost promoted pins (also referred to as Pinterest Ads). Pin Practical Promotions does not cover the basics of implementing a Pinterest strategy. If you need help with the basics, my course Pin Practical Masterclass is perfect for you! I suggest learning the basics of Pinterest before proceeding to promoted pins. This course will benefit businesses with a small or large advertising budget. My methods teach you how to get results at a low cost. The bigger the budget, the more you'll be able to scale. If you have a small budget, you'll benefit from maximizing your ad dollars! Some of the basics you can find online for free. Pin Practical Promotions breaks down the tech side of implementing promoted pins and teaches you a unique strategy for creating profitable campaigns at a low-cost to you. I explain exactly how to read your results and optimize your campaigns for prime performance -- something that is not available online for free. Is the course overly complicated from a technical standpoint? One of the reasons I created Pin Practical Promotions is because I know technical details (like inserting code on your website) and analyzing data can be super overwhelming. My background is in marketing data and analytics. The good news is, I have a super power that allows me to break it down in an easy-to-understand manner for my students. I promise you do not need a degree in math to figure this out. I take you step-by-step and show you exactly where to find and place code on your website and how to analyze your results using shortcuts. Plus, if you end up stumped, that's why we have a course Facebook group so you can get help! How do I access the Pin Practical Promotions course? Great question! Pin Practical Promotions is hosted on the Thinkific course platform. When you checkout via a secure connection with Thinkific, you will be prompted to create a username and password. After you create your username and password, you'll be sent to a secure checkout form where you can use any major credit card or PayPal for payment. You'll have access to Pin Practical Promotions for as long as the course exists. Including all updates to the core curriculum. This does not include guaranteed access to future bonuses. Please read our terms and conditions for more information. In what countries are promoted pins available? Pinterest has not made their ads platform available to everyone just yet. If you live in and have your account set up in one of these countries, you can promote pins on Pinterest. Does Pin Practical Promotions include the latest updates to the Pinterest ads platform? Absolutely! One of the reasons I provide a bonus Facebook group with the course is so that I can keep you informed in real-time about changes to the Pinterest ads platform. The course is constantly being added to and updated as Pinterest is rapidly making changes and enhancements to promoted pins. Is this just theory or does this method really work for different niches? Can you guarantee results? This method really works. I can’t guarantee results, I can show you real results for myself, clients, and students. For example, Heather Farris, Ruth Rackley, Kara Fidd, Amber Roshay, and Kristen Raney saw success with their first campaigns using the methods taught inside the course. Heather's target market is the overwhelmed mom. Ruth's target market is healthy living and new essential oils users. Kara helps bloggers DIY their own graphics. Amber helps parents write books and Kristen is a gardening blogger. Inside the course, you'll have access to several different case studies so you can learn from other's experiences in different niches. How long will it take me to finish and implement what I'm shown? Several students report that they make their way through modules 1-4 in 2-3 hours. Module 5 dives into setting up your reports to analyze your campaign performance and how to optimize your campaign once it's been running for several days. This module will most likely take 30-45 minutes the first time you work your way through it. Will this work on my platform? Pin Practical Promotions teaches you how to set up, run, and analyze promoted pins using the Pinterest ads dashboard. In order to retarget using the Pinterest Tag or track conversions using Pinterest event codes, you must have the ability to install code on your platform. It is your responsibility to make sure you can install code on the platform you use for your website, email signups, e-commerce store, etc. I add new platforms as I'm provided the information from current students who join the course. Certain e-commerce sites may have limitations in regards to the data available for promoted pin results. For example, the Teachers Pay Teachers (TpT) platform does not allow you to install the Pinterest Tag or event codes. Therefore, you cannot retarget visitors who visited your TpT storefront using the Pinterest Tag. You will not be able to track conversion data (purchases) through the Pinterest ads dashboard. Please make sure you are aware of any data limitations for the platform you use before purchasing this course. Which platforms do you cover in the course? I provide information on how to install your Pinterest Tag and event codes for WordPress, Squarespace, LeadPages, ClickFunnels, Teachable, Thinkific, SendOwl and Shopify. I also cover how to work around the limitations for tracking conversion data on TpT and Etsy. If you are concerned about whether this course will work for your platform, please use the chat function on this page to discuss your unique situation with me. I am confident Pin Practical Promotions can work for you. With our happiness guarantee, you can purchase risk-free. If you complete the course, set up your first campaign, and complete the workbook assignments and still don't feel like it's a fit for you, you can request a refund. For complete details on our happiness guarantee, including the refund timeframe, please refer to our terms and conditions. Your next-level course on how to strategize, implement, analyze, and refine profitable promoted pin campaigns at a low-cost! SIGN ME UP FOR THE WAIT LIST! After not having the results I pictured from Facebook ads, I was worried that I would have the same results here. I decided to start small and see what would happen. The first ad I ran was for a new opt-in. While I had it on my site for about 2 months, I had only received 4 new emails. I ran a pinterest ad for only 5 days at $2 a day. I received 16 emails for that opt-in during the ad run! While these are really low when you looks at just the numbers, it was a 400% increase for that one opt-in! Now, I'm receiving opt-ins daily for that freebie and sold on Pinterest ads. ~JAMIE VAN CUYK, Jamie V.C. My biggest takeaway is that promoted pins are actually very doable. Up until now, I was too intimidated by the idea of trying them for fear that it would all be above my head. You've broken everything down into manageable, east-to-understand steps and taken the fear out of it. Pin Practical Promotions is very thorough. I don't feel I need to take any courses to supplement it. I had no idea there was so much that could be done within Pinterest. Tracking a person from Pinterest on my site to how little it costs to run a Pinterest campaign. I'm looking forward to seeing results from what I learned! I love how detailed your course is as well as your videos and screenshots. The screenshots made it so much easier to follow along than just text. I haven't come across a Pinterest course like this before that includes so much information as well as the support to ask questions in the Facebook group!